North America is the World’s third-largest continent – 24,474,000 km² covering approximately 16.5% of the Earth’s land and 5% of the Earth’s surface. 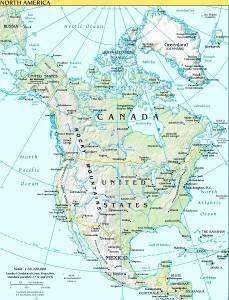 It is bordered by the Atlantic Ocean to the east, the Arctic Ocean to the north and the Pacific Ocean to the west. The eastern side of the continent is generally lower than the west which contains the Rocky mountains. The five Great Lakes lie on the United States Canadian border. The highest mountain is Mt McKinley in Alaska (6,194 m) and the longest river is the Mississippi (3,765 km). 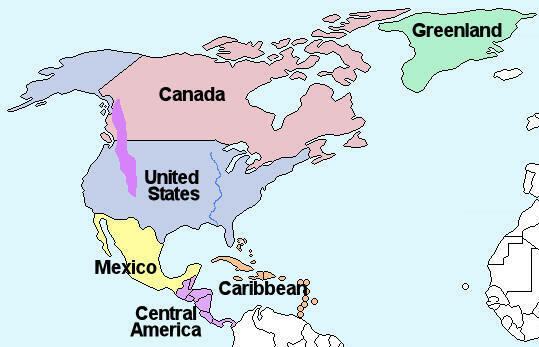 North America can be broadly divided into the six regions shown on the map (right). Mexico, Central America, the Caribbean and southern United States have more constant temperatures throughout the year but have a wet season – May to October and a dry season – November to April. Coniferous forest – Also known as Taiga, cold and dry with snowy winters and warmer summers. Tundra – This area is characterised by a layer of permafrost (soil that has remained below freezing for at least two years. Winters are very cold, summers are warm and there is little rainfall. Alpine/mountain – Cold, windy and snowy. It is winter from October to May with temperatures below freezing, while summer is from June to September where the temperature can reach 15°C. There are 38 countries and Islands in North America. Anguilla, Antigua and Barbuda, Aruba, The Bahamas, Barbados, Belize, Bermuda, British Virgin Islands, Canada, Cayman Islands, Costa Rica, Cuba, Dominica, Dominican Republic, El Salvador, Greenland, Grenada, Guadeloupe, Guatemala, Haiti, Honduras, Jamaica, Martinique, Mexico, Montserrat, Navassa Islands, Netherlands Antilles, Nicaragua, Panama, Puerto Rico, Saint Kitts and Nevis, Saint Lucia, Saint-Pierre and Miquelon, Saint Vincent and the Grenadines, Trinidad and Tobago, United States of America, US Virgin Islands. The United States and Canada are the most economically developed countries. The countries of central America and the Caribbean are less economically developed and poorer. The plant life of North America is characterised according to climatic region. The coniferous forest region contains trees such as pine, fir and spruce. 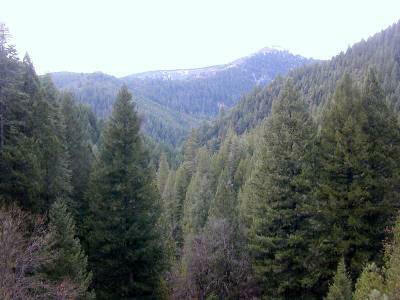 The picture (left) shows a coniferous forest in northern California. Due to the cold during the winter months, only short grasses and shrubs can survive in the tundra and alpine/mountain regions. The grassland region is characterised by large open areas of tall or short grass. North America is home to a range of wild animals including the bobcat , sea otter, racoon and the mountain lion. 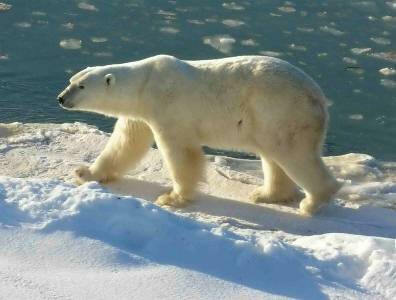 Polar bears, wolves and caribou live in the arctic regions of Canada and Greenland.